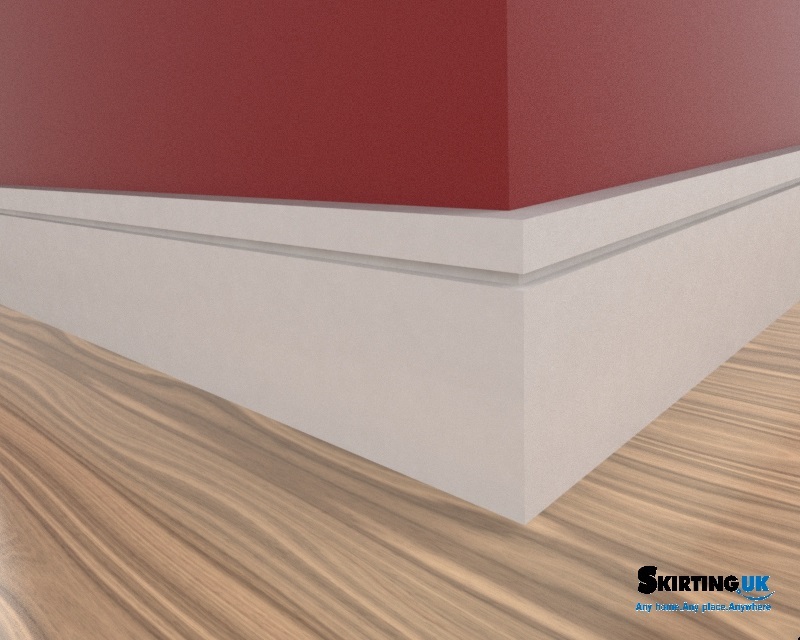 The Grooved Square skirting board is one of the many perfect profiles for a modern home style. One of our most popular MDF skirting boards; Square Grooved Skirting Board. This design has been seen in a multitude of modern and contemporary projects. We have seen this profile been ordered for modern renovations, swanky bars and restaurants as well as a variety of inner-city hotels. The straight linear lines, geometric grooves and clean edges make this skirting board perfect for any room with modern décor. We donated this exact profile to the BBC renovation television programme, DIY SOS: The Big Build. They ordered a batch of Square Grooved Skirting Board and Architrave for one of their largest builds yet! They chose a height of 250mm and a depth of 18mm. 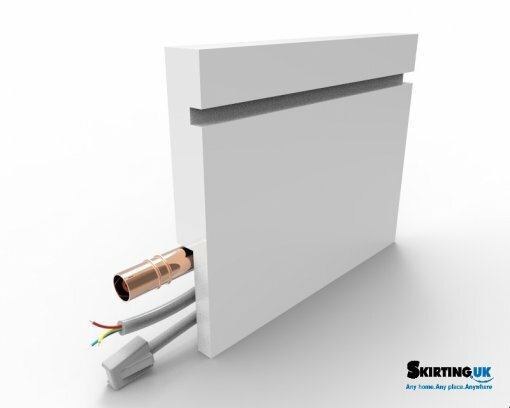 Images for their build can be seen in the profile gallery as well as over on our Instagram, @SkirtingUK. The height of the groove is 6mm and has a depth of 3mm. 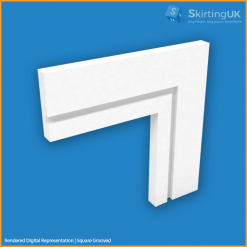 This design can also be ordered as MDF architrave, and when ordered together this creates a seamless look in your home. With the right joinery, it is possible to line up the groove through the skirting and onto the architrave. 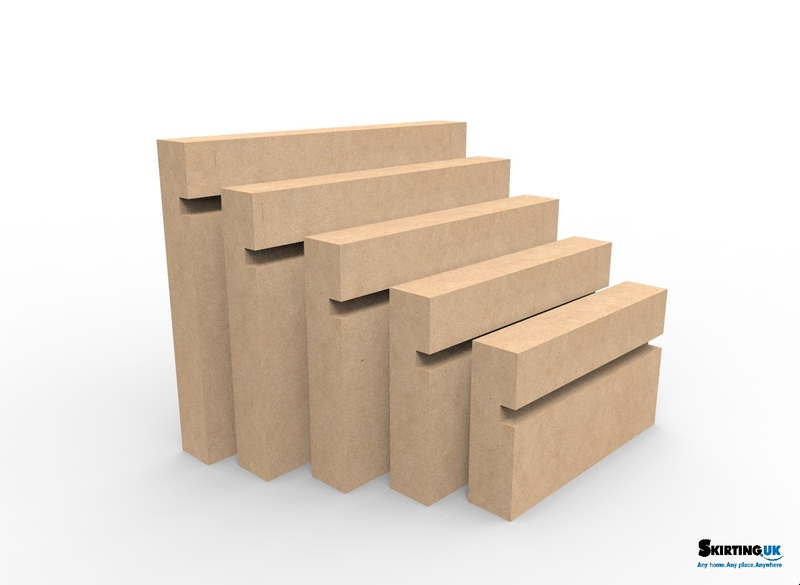 HEIGHT Square Grooved skirting boards are available in 12 different standard heights ranging from 70mm – 400mm. Please note if you require a different height we can custom make your recommendations. At Skirting UK, we only ever use the highest quality products. Our MDF is moisture resistant and industrial grade material, making it super easy to work with but the MDF keeping the costs lower than other ‘real wood’ options such as Oak. We source all our paints from primer to gloss from a local yet reputable company, Morrells. This is then applied finely through our spray gun by our spray technician, leaving a stunning finish, every time. Our skirting board samples are available in one standard size 120mm x 18mm x 95mm and are finished in white primer. Sample orders are posted out to you within 1 – 2 working days via 1st Class Royal Mail. Custom-made samples are a great way to find out if a particular skirting or architrave height will work in your home, before placing a full order with us. If you would like to see a sample of the exact skirting or architrave height there is a nominal charge of £7.50 (Ex VAT) each sample will be made individually by our professional production team.